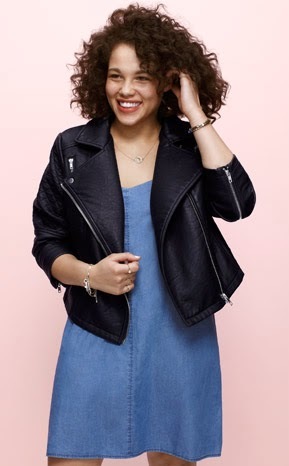 The weekend is upon us, the rain may be falling but spring is very much on the way so I thought the images for the preview of Asos Curve's SS14 collection might brighten things up a bit! Step into spring with ASOS CURVE SS14 collection. This season sportswear takes centre stage with motocross references, Aertex and leather toughening up the trend. Sheer panelling across slip dresses and stripe pleating update a casual look, and androgynous tailored macs are reworked with zips on mesh for an unstructured take on the spring jacket. 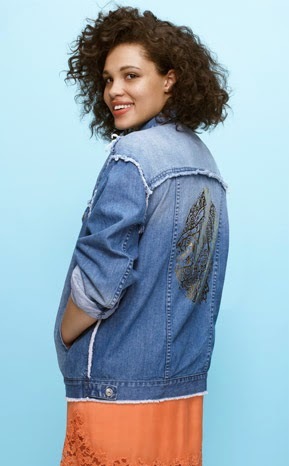 Denim – bleached, frayed and oversized – makes a statement with stamped metallic Hindi-inspired crests for the summer season. Now let's get on to the pictures!! I think the looks are really strong and the standout pieces have to be the indie print dress and floral cami/culottes, which I can't wait to get my hands on. What do you think of the preview images?